Play Ball: Los Angeles Dodgers Celebrate 60 Years in L.A.
You are at:Home»Blog»Play Ball: Los Angeles Dodgers Celebrate 60 Years in L.A. 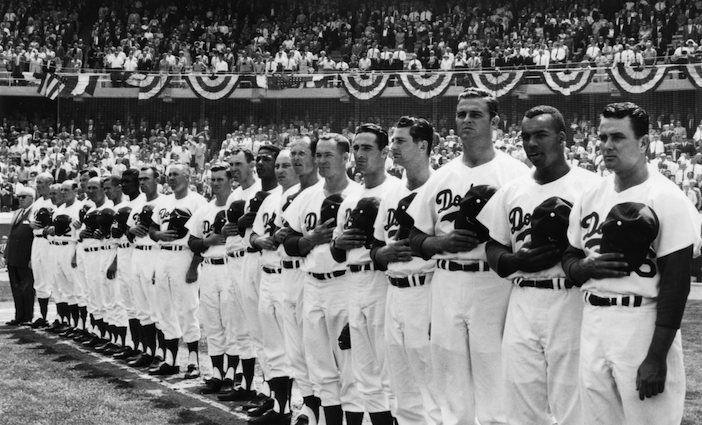 The Dodgers lineup on Opening Day at Dodger Stadium, April 10, 1962. The Los Angeles Dodgers are celebrating 60 years in L.A. For the last 56, they’ve called dodger stadium home. Welcome to the west’s oldest, biggest and, dare we say, best major league ballpark. Tucked into hilly Chavez Ravine around Elysian Park, Echo Park and Chinatown, Dodger Stadium is one of the greatest stadiums in the country and, at 56 years old, the oldest in the western United States. Angelenos from all walks of life make a pilgrimage to the stadium each season, treasuring their distinguished ballpark, win or lose, because baseball has a way of unifying people. And Dodger Stadium has its own special way of welcoming them. Built from 1959 to 1962, it’s the oldest major league ballpark west of the Mississippi and the third-oldest overall. It was the first privately financed baseball venue since Yankee Stadium—costing $23 million to build ($185 million in 2018 dollars)—and it was the last until San Francisco’s AT&T Park in 2000. Since the day Dodger Stadium opened, it’s been the largest baseball stadium in the country. In 1978, the Dodgers became the first MLB team to set an attendance record of 3 million in a single season. During the 2007 season, the “Boys in Blue” had their largest attendance: 3,857,036. A conditional-use permit limits Dodger Stadium’s seating capacity to 56,000, but after years of structural changes, only the owners know the actual number, and they’re not talking. 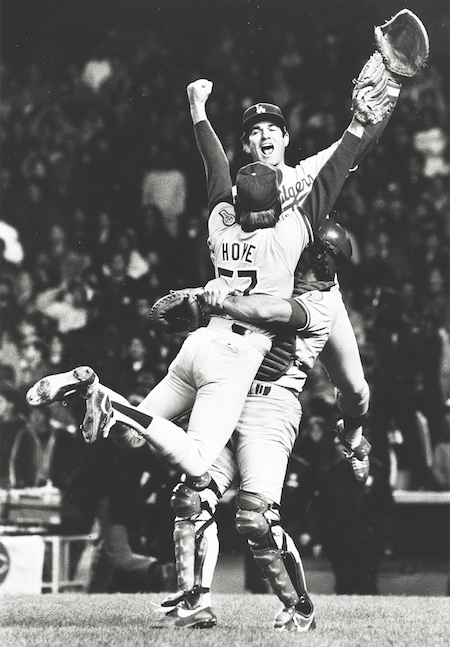 Steve Howe, Garvey & Steve Yeager celebrate the 1981 World Series win. In its six-decade history, Dodger Stadium has seen legendary events, such as Sandy Koufax’s perfect game in 1965; the reign of ’70s superheroes Steve Garvey, Ron Cey, Bill Russell and Davey Lopes; the 1980 All-Star Game; the 1981 rise of Fernandomania; and Nomo Fever in the ’90s. There was also Kirk Gibson’s walk-off home run in Game 1 of the 1988 World Series, the 1984 Olympic Games baseball competition, the 2009 World Baseball Classic final and the long-awaited 2017 World Series. Dodger Stadium was also the home of the Los Angeles Angels from 1962-1965, and it has hosted other sporting events: Cricket All-Stars, NHL ice hockey (with rock band Kiss performing at intermission), the Harlem Globetrotters, boxing, motorcycle racing and monster trucks. It’s been a history-making tour stop for the Beatles (on Aug. 28, 1966, their second-to-last concert ever), Michael Jackson, U2 and Pope John Paul II. 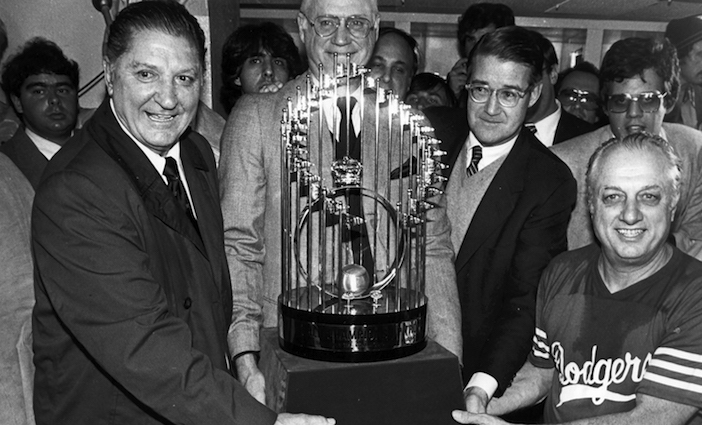 Dodgers Vice President Al Campanis, Baseball Commissioner Bowie Kuhn, Dodgers President Peter O’Malley and Manager Tommy Lasorda pose with the 1981 World Series Championship trophy. 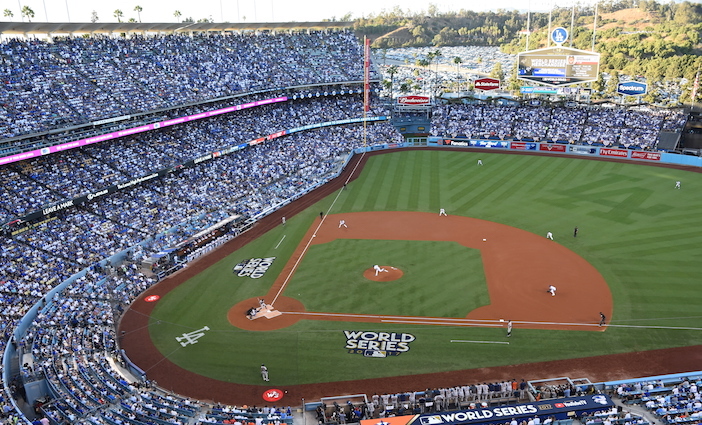 The ballpark has hosted nine World Series, four of which the Dodgers won. They’ve also won nine National League pennants, 16 NL West Division crowns and two NL Wild Card berths. After a 29-year dry spell, the Dodgers charged into the 2017 World Series against the Houston Astros; the teams combined had suffered 83 years of championship drought. In the end, 26 records were broken, but the Dodgers lost 5-1 in Game 7 on their home turf. Known as a “pitcher’s park,” Dodger Stadium is the only NL venue with symmetrical outfield dimensions. It’s seen more than a dozen no-hitters, including two perfect games. In 2009, the Dodger Stadium area was officially designated as Dodgertown with its own ZIP code: 90090. Offseason, the structure is repainted every year. The official color of Dodger blue is Pantone 294. What the numbers don’t tell you is that, if Brooklyn Dodgers President Walter O’Malley had gotten his way, there never would have been a Los Angeles Dodger Stadium. The team now known as the L.A. Dodgers has played baseball since 1883, when they began as the Brooklyn Grays. In 1895, the team became the Brooklyn Trolley Dodgers, named for the frightened locals dashing across streets filled with speeding streetcars. Team members included all-time greats Pee Wee Reese, Zack Wheat, Gil Hodges and legendary infielder Jackie Robinson, who broke baseball’s color barrier in 1947. By then, their Ebbets Field stomping grounds were dilapidated beyond repair. Determined to build a new ballpark, O’Malley asked New York authorities for funds to build the first domed arena in the country, designed by Buckminster Fuller. But O’Malley’s big idea would cost big money, so he struck out. Meanwhile, Los Angeles was a rapidly growing city with big league dreams. In 1953, new L.A. City Council member Rosalind Wyman tried to lure an MLB franchise by sending a letter to every team, hoping one would become the first to move west. No one took a swing, but O’Malley decided it might just be the bluff he needed to get New York to play ball. 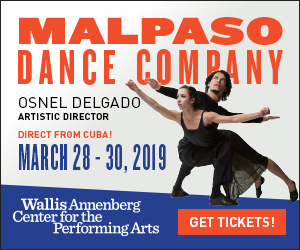 So, he flew to L.A. and toured Chavez Ravine, which had been home to generations of mostly Mexican-American families before the city cleared the land in the early 1950s for a public-housing project that never materialized. Suddenly, O’Malley saw the potential: lots of space, great weather and a growing population with only two minor Pacific Coast League teams—the Hollywood Stars and L.A. Angels. With “Boys of Summer” Dodgers including Don Drysdale, Koufax, Reese and Duke Snider, the team could become local heroes. The City of Los Angeles gave the Dodgers 300 acres in exchange for the deed to Wrigley Field (which O’Malley owned) and a promise to build a 50,000-seat stadium. Amid controversy, remaining homeowners were bought out and O’Malley set to work, breaking ground on Sept. 17, 1959, and leveling 8 million cubic yards of earth—which buried an elementary school under the parking lot near third base. Battles in courtrooms and voting booths cost years of construction delays, plus $900,000 to rent the Los Angeles Memorial Coliseum for two seasons. The Dodgers were there for four. 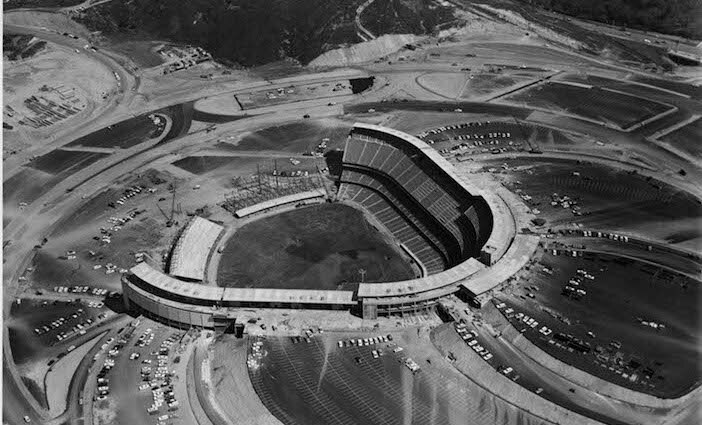 An aerial view of the nearly completed Dodger Stadium in March 1962. Construction on Major League Baseball’s most “futuristic” ballpark hadn’t yet begun when the crack of the L.A. Dodgers bat was first heard April 18, 1958, at the Coliseum, a football arena for the USC Trojans, UCLA Bruins and L.A. Rams. Both the Dodgers and archrivals the Giants left New York that year, changing baseball forever by expanding the sport’s reach to the West Coast. The Dodgers won their first game at the Coliseum, defeating the Giants 6-5, and finished their first year in L.A. in seventh place. At Chavez Ravine, architect Emil Praeger took advantage of the rolling terrain by carving the main seating amphitheater from the hillside so that each of the six levels were at grade, from the field to the top deck. Twenty-one entrances streamlined the vertical circulation around the stadium perimeter. Benches were cut into the sloping ground to support stadium foundations and pedestals. Parking was built for 16,000 cars. O’Malley insisted the stadium be constructed of concrete rather than steel, so he hired a contractor who specialized in freeways. The bright color scheme—yellow, light orange, turquoise and sky blue—gave the stands midcentury style. The field was planted with Santa Ana Bermuda grass. With unobstructed sight lines, there were no bad seats—not even in the nosebleeds. The official opening of Dodger Stadium on April 10, 1962, was attended by 52,564 fans. O’Malley’s wife, Kay, tossed the ceremonial first pitch to catcher John Roseboro. By Kay’s side was her son, Peter, who would become president of the Dodgers in 1970. Latina diva Alma Pedroza sang the national anthem, and the game was broadcast on the radio in English and Spanish. Ticket prices ranged from 75 cents to $3.50 and would remain unchanged for 18 years. Johnny Podres threw the first pitch to Eddie Kasko of the Cincinnati Reds. Snider got the first hit for the Dodgers, but they lost the game 6-3. The next day, they won their first Dodger Stadium game, with Koufax pitching and Jim Gilliam batting the first Dodger Stadium home run. In the third game, rookie Pete Richert tied a major league record by striking out the first six batters he faced in the big leagues for an 11-7 win. The biggest crowd complaint was that the stadium had only two drinking fountains. After 40 years in L.A., the family-owned Dodgers franchise was sold by O’Malley to Rupert Murdoch’s behemoth News Corp. for $350 million. In 2004, it was sold again for $430 million to real-estate developer Frank McCourt. The Dodgers hadn’t won a postseason game since winning the 1988 World Series, and their bad luck reached a fever pitch with McCourt. He allegedly raided the club’s cookie jar, then filed for bankruptcy, leaving the Dodgers hundreds of millions in debt. As the team struggled on the field and attendance fell to a 15-year low, MLB assumed control of the Dodgers’ finances and forced the team’s sale. In 2012, led by former L.A. Laker Magic Johnson, current owner Guggenheim Baseball Management paid $2.15 billion—the most ever for a sports team. The group has since invested millions more for hexagonal HD video boards (in honor of O’Malley’s original stadium aesthetic), a new sound system, concession stands, clubhouses, an awards gallery, batting cages and a state-of-the-art workout facility. Why? “We want to win,” Johnson said. No one had wanted to win more than the Dodgers’ two Baseball Hall of Fame managers: Walter “Quiet Man” Alston and gregarious Tommy Lasorda, who served back-to-back for 44 years. Alston was in charge for 23 seasons and managed the Dodgers to 2,040 wins, seven pennants and four World Series victories. He also helped break down barriers for women when, in 1974, he invited Anita Martini to become the first female journalist allowed into a major league locker room for a postgame news conference. Lasorda managed the team from 1976-1996 and has spent 68 years wearing Dodger blue. “I have been proud to wear four uniforms: the Boy Scouts of America, the U.S. Army, U.S. Olympic baseball and the Dodgers,” he wrote in a memoir for the team’s 50th anniversary. Lasorda was inducted into the National Baseball Hall of Fame in 1997 and, today, serves as special adviser to the chairman. “That’s pretty good for a skinny left-hander from Norristown, [Pennsylvania,] who just wanted to pitch like my favorite Dodger,” he wrote. 2017 World Series Game 1 at Dodger Stadium. Scully is quick to deflect praise to Dodgers fans. “The roar of the crowd has always been the sweetest music. It’s intoxicating. I try to call the play as quickly as I possibly can and then shut up and let the crowd roar, because, to me, the crowd is the most wonderful thing in the whole world when it’s making noise.” Still, as with Lasorda, there’s no way to separate Scully from the team’s identity. The last vestige of a bygone era no longer invites listeners to “pull up a chair” in his broadcasting-booth soliloquies. The Vin Scully Press Box will never be the same, though legendary Dodgers coach Manny Mota and Dodgers All-Stars Orel “Bulldog” Hershiser, Rick Monday and Valenzuela still command the mic alongside Hall of Fame broadcaster Jaime Jarrín, the Dodgers’ Spanish-language voice for 60 years. All photos courtesy of the Los Angeles Dodgers.